Getting a nail stamping kit is one of the basic goals today for the millennial and the teenagers who love playing with shapes and colors on their nails. But the fact is that getting the perfect looks through nail stamps is not as easier as it seems to be. You need to have no-budge nail stamps as well as smooth and stable nail colors to make the stamp look finely finishes without any blunders. For helping out the users, we have enlisted 10 of the best nail stamping kits to make sure they get perfect shine, perfect patterns and perfect finish on the nails even if they don’t have an access to an expert nail art professional. For perfect nail stamping and getting the best-desired results, you need to have the stamps with the desired pattern applied carefully on the nails. It is better to use them with stamping nail color so that they can be dried out without budging the design at all. 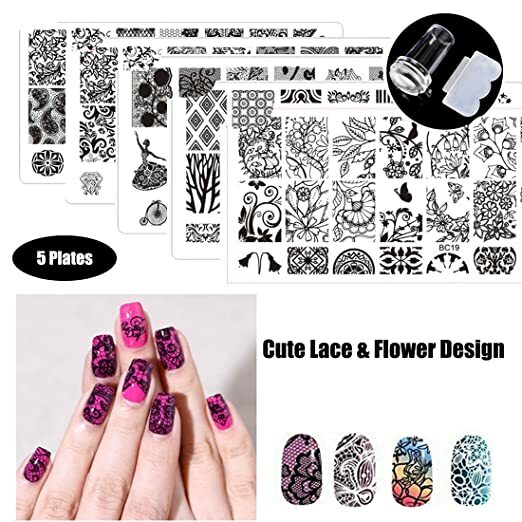 This package includes 10 stamping plates, storage bag and stamper set for perfect design on your nails without any issues. 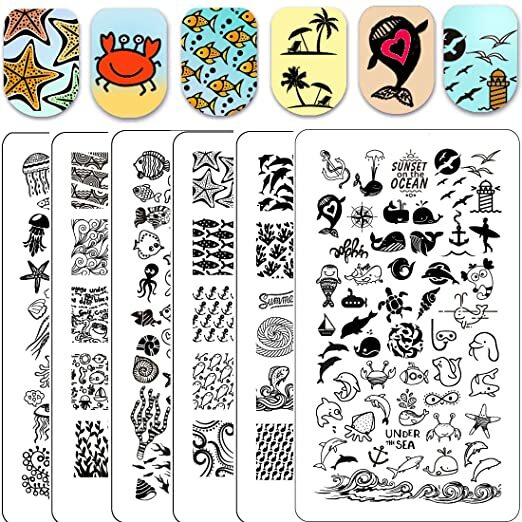 The stainless steel stamps make sure they last longer and better and offer a range of stamping designs to make the nail art fun and excitement whenever you need a new look on your nails. This one is one of the best and the most complete kits that you may use if you are a regular user of the stamping plates on your nails. Definitely, you need to scrape and reapply the designed when needed, the kits have it all for you to help in each and every task to get a newer look on the nails. 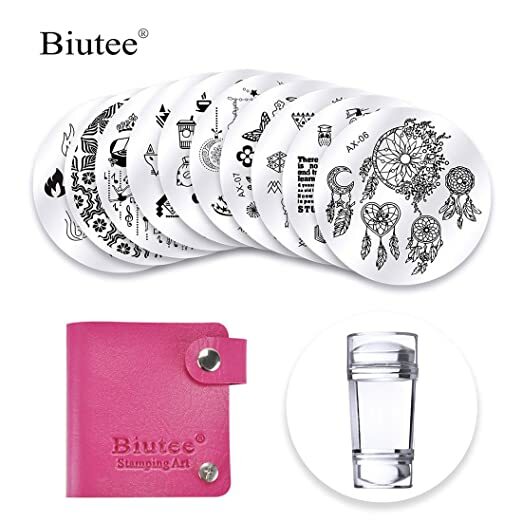 The package includes 5 pcs of high quality, well-made stamps made up of stainless steel that assure better designs and nail art system for easier design and application. The patterns are unique and allow you to create the designs you need. These stamps are perfect for DIY nail art and can be achieved easily with a stamper at home. This 5 PCs stamping set for nail art by DAODER assure easier and better use of nail art stamps to get the desired patterns and design on the nails in a quick and easy way. The pattern or stamping plates are made up of high-quality stainless steel that assures deep, precise and accurate carving on the nails and can be applied in simple and easy steps that can be done by anyone. The kit includes silicone stamper and stainless steel carving plates to get the perfect nail look easily. This is one perfect nail stamping kit that offers Halloween and Christmas based theme and patterns for easy application on the nails. With a little bit creative application, you can easily get the perfect look for any occasion in just simple steps by applying the stamps on the nails and getting a fine and carved look within minutes. The deep and precise carving plates make sure to provide fine and accurate design to get the nail art to the next level even if you are not an expert in this. For those who are looking for all in one solution with the stamping kit, this kit assures easier application of the nail art components, best stamping design, and tools along with the tool that is needed which are the scraper tool and the rhinestone for adding an extra pretty touch on your nails. The kit includes 4 pcs of round stamping plates 1 stamper and 1 scarper and mixed rhinestones along with 4 sheets of nail sticker decal. Now, you can see there is nothing else except for a nail stamping nail polish that you would need for getting a perfect nail art look on your nails with their kit. These components make sure you get an easy way out for getting the best designs on your nails. 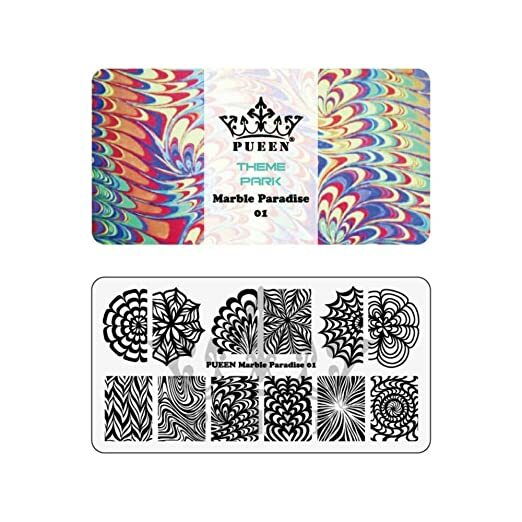 PUEEn nail art stamping plate offers a unique way to create unique designs on the nails for better art and design impact on the nails. These plates are made of stainless steel for long-lasting performance and make sure they are easy to use and provide exact and accurate results on the nails. These offer deep and fine carving for a perfectly professional finish on the nails. 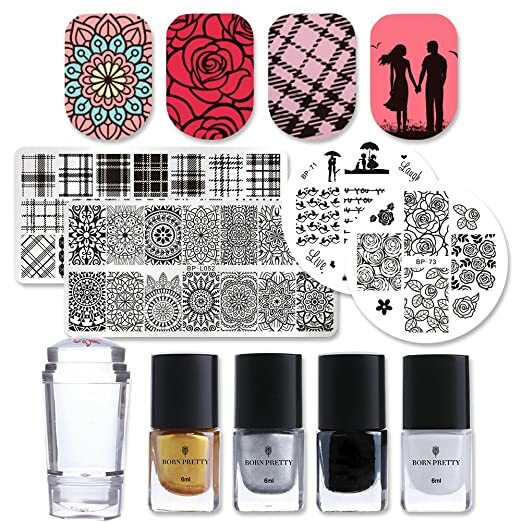 This is a 6 pcs kit consisting of nail art stamping templates and stamper for easier, better-looking nail art finish. The nail stamps include floral designs and Japanese patterns that can be used to create unique and good looking designs on the nails which can be paired easily with other nail art components. 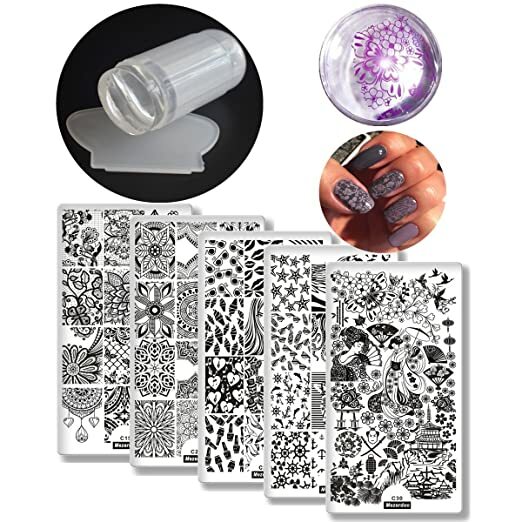 The nail art stencil and the stamper pairs to offer easy stamping process for quick patterns carved on the nails having a fine and precise finish for better designed unique looks on the nails. Ejiubas stamping kit for the nail art is a unique way to get the desired designs on the nails in an easier way. 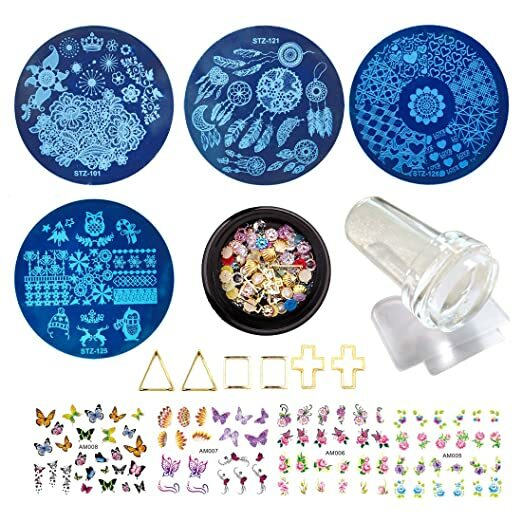 The kit includes double-sided plates to get the unique designs having intricate patterns that include flowers, and other abstract and well-defined designs that can be worked into many other patterns with a certain level of creativity. The stamp offers perfect size for better nail coverage and makes sure it is easier to work with for the pros and the beginners at the same time. The edges of the plates are sanded so that there is no hurting experience or bruises while applying on the nails. Born pretty offers a complete solution for the nail stamping needs in this perfect little kit that includes the silicone stamper, the stamping nail polish, and the nail art stamping set for easier, quicker and better nail art process you could do at home. 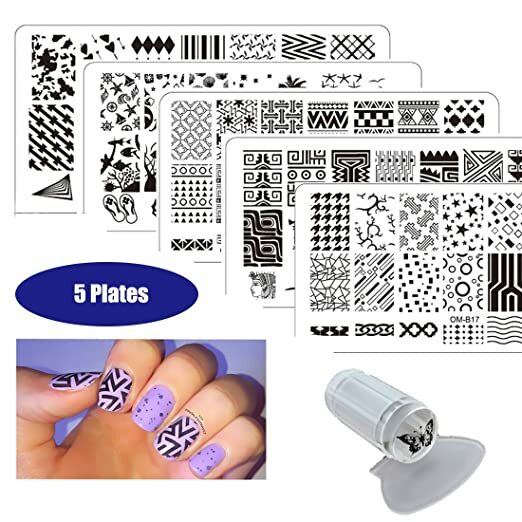 The package includes 4 of the best-carved stamping plates to help you carve the designs and patterns you love on your nails. In addition to that, there are 4 bottles of high-quality stamping nail polish to get the carving right and make sure to dry out quickly so that you don’t have to bear with a budged look on your nails. The clear stamper assures clean and clear stamping process with greater visibility. With the help of these tools, you can surely get the desired pattern within minutes. For a unique design every time you play with your nail color and designs, you need a newer and better pattern. For this purpose, you have to have options with you. 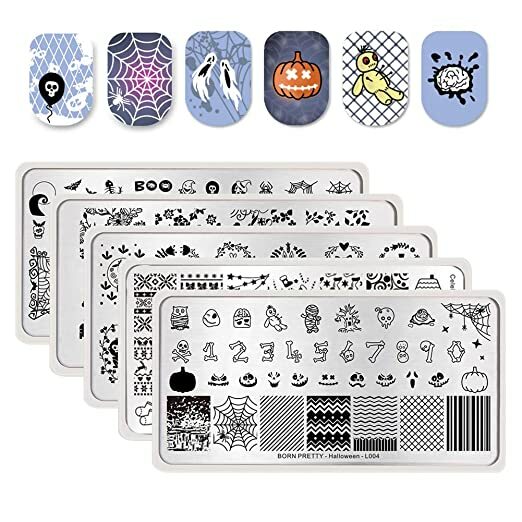 These nail art stamping kits give you the possible options to make sure you get all the unique ideas and get creative to make sure you get the nail look you have been thinking about. The kit includes the 30 uniquely designed stamping plates whereas there are 6-10 designs available on each of the plate. It also includes a stamper and a scraper to make sure you can work with your nail art system efficiently and actively. Always make sure your kit contains well-carved, sturdy stainless steel stamping plates to assure firmer hold and better carving on the nails. Make sure you know the size of the nail stamping plates so that they can be sued in an easy way. In some kits, the nail stamping nail polish is included but if not, you may need to arrange the nail stamping nail polish to get the perfectly carved nails design otherwise you may get some budged looks. Try to get a kit with a scrapper and a silicone stamper if you are going to use the stamping kits and plates for the first time and haven’t got any previously because without these two tools you may not get the results as expected. You have to be sure that the components of the kit are user-friendly and allow easier and long-lasting usage for beginners as well. You can surely find one of the best stamping kit to use at home but it is important to know about using the kits in an effective manner. For this purpose, you can get help from the customer support from whom you are buying the kit or there are plenty of tutorials available that are enough for guiding the newbies to use the stamping kits on the nails for perfectly carved designed on them.